LOVEFRESH has updated their packaging! Enjoy the same natural product that you know and love, in an all new sleek design. Please note, that you may receive either of the above pictured items while we update our inventory. 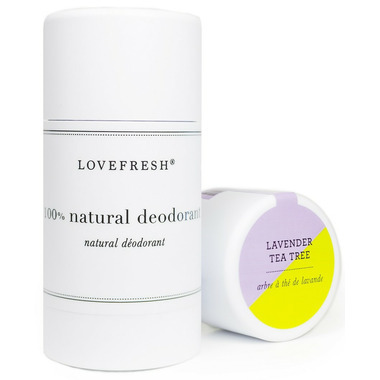 Love Fresh's all-natural deodorant will keep you smelling fresh all day long! By using this wonderful deodorant you can feel comfortable that you are not putting any harsh chemicals under a very *vulnerable* part of your body. It really, really works. Ingredients: Fair Trade Shea Butter, Coconut Oil*, Kaolin Clay, Sodium Bicarbonate (aluminum-free), Natural Beeswax and natural organic essential oils*. This is the best natural deodorant I found so far. It smells neutral and lasts during the day (around 12 hours). It might be not the best option for people expecting 24/7 protection, but if you are looking for a good natural deodorant that's the one. I'm blown away! Finally, I have found a natural deodorant that actually works. I love this deodorant! Smells amazing, although a delicate scent, and it works great. This is my favourite natural deodorant. I have been searching for a natural deodorant for years and this is the only one I found that actually lasts all day. Also, it smells amazing! I've had rash problems with many deodorants. 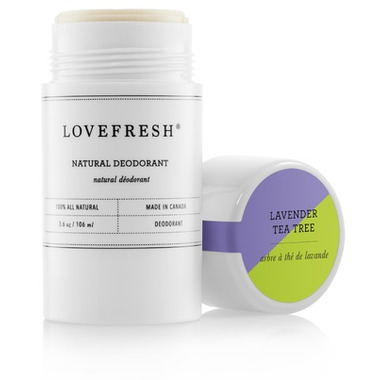 The Lovefresh Lavender Tea Tree Natural Cream Deodorant Stick was a Godsend - no adverse reactions, pleasant odour and long lasting protection - who could ask for more? Prior to using this deodorant, we struggled to find a natural deodorant that would last all day, especially for my husband who works in construction. This stuff keeps you dry and fresh all day long, and smells delicious! Perfection! I tried many other natural deodorant. That one lasts 24hrs and smells amazing! I personally find it soft under my arm unless i keep it in a very cold place (below 20 degree C). I have tried a couple other natural deodorants (Jason, Toms) and every time I was left feeling not so fresh and found the texture overall very sticky after applying. I've been trying to find and make the natural switch for a while, so I thought I would try ONE MORE. I did quite a bit of research and read and bunch of reviews, and was still skeptical, especially if I was going to try something and spend the kind of money that LoveFresh is (compared to other stick deodorants). But, I tried, and Im SO glad I did! This product is FANTASTIC! It has a great lavender scent that I found lasts thorough the day (obviously not as strong as when you first put it on). Its not sticky like most natural deodorants, nor is it a totally smooth glide if you're used to regular deodorants (Secret, Degree, etc.). But, I do find it goes on very easy and I love the creamy dry feel. Best of all this is a locally made product! I would highly recommend! I was unsure about this product as a lot of natural deodorants in the market don't work, but I'm glad I bought it. It held up pretty well and the first time I tried it was during an intense and sweaty workout. Love the lavender and tea tree scent - it does fade away, but leaves your armpits stink free! It doesn't glide on like regular deodorants (more solid), but you don't need a lot of product anyway. I can't wait to try the other scents! I've only tried one or two other natural deodorants that didn't work at all, so I was skeptical with this one; however, it keeps me feeling dry and reapplying midday isn't always necessary. It goes on dry and stays that way, has a pleasant scent; and I'm glad that I have a natural alternative (that works) instead of going back to my antiperspirant.